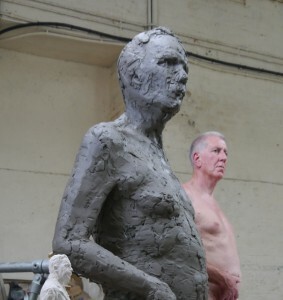 In order to sculpt a convincing figure of Sir Nigel, I need a life model. Like Rodin, I use the traditional technique of sculpting the figure unclothed first, before sculpting the clothes. Barry McGerr was my first choice. 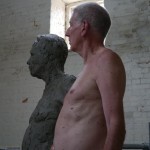 He had modeled for my portrait sculpture courses a couple of times. He was a good age and figure. And he was a great fan of Sir Nigel. Before the first session I had started to get some clay on the armature, working from the maquette and the scaled-up measurements. In the early stages of ‘blocking-out’ in clay, you have no need for small tools only a small block of wood to apply the clay. With the arrival of Barry we work on the pose, using a template for his feet so that each time we get the same pose – one straight leg and one outstretched leg, bent at the knee. I have to work out the relationship between the figure of Barry and the 7ft 5in figure of Sir Nigel. More measurements and proportional calipers are the answer. As with any figure or portrait, you need to get the structure right before you get to any details, which is months away at this point. With a life model you can test the integrity of the pose. 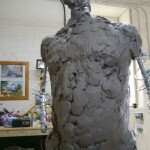 I want a little more of a turn of the upper body than is shown in the maquette. 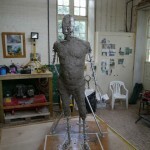 Now is the time to make the amendments, before too much clay is on and the armature is hidden deep. Barry is incredibly patient. We take regular breaks for injections of sugar and caffeine, as it is tiring for both of us. He keeps me amused as he is a bit of a raconteur. We will be working together for a number of months, so having an enjoyable working relationship is invaluable. Thanks Barry, I couldn’t have done it without you!